Its hard for me to believe that i’ve been maintaining this program since 2011. I’ve added to this as I needed extra functionality and for the last 12 months or so its been untouched but for the last few weeks I’ve been rewriting some parts I wasn’t happy with and changing a few things around. Its now got to the point where I think its pretty much complete (although i’ve said that before) so though it was about time I did a proper post on some of the things it does and how to use it. I wont go into everything as I dont think I need to but let me know. 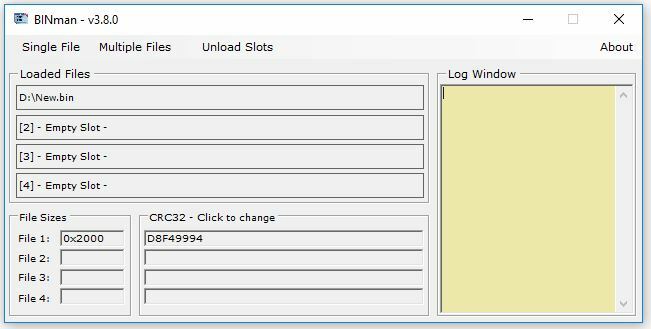 Back when I started this program I wanted a quick, easy and no fuss way of quickly interleaving, deinterleaving and byte swapping files. That’s exactly what it did but that’s all it did. 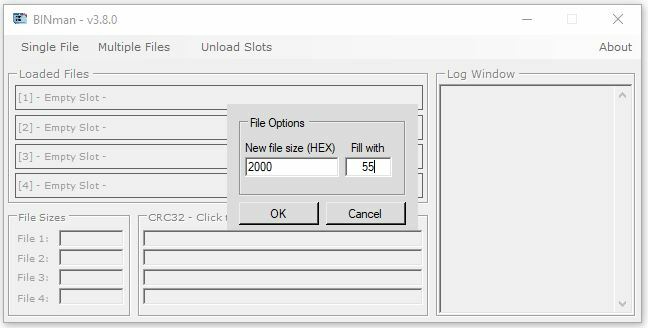 You can fill the new file with a byte pattern or a word pattern. 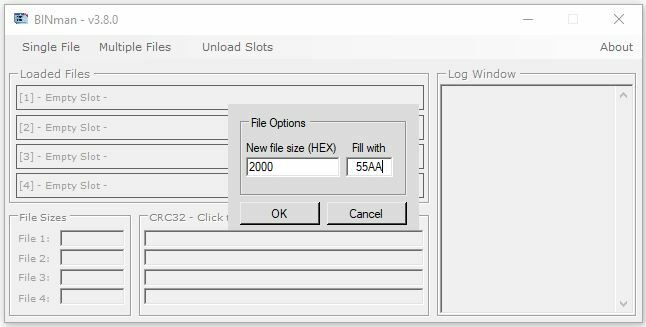 If the slot is empty you can also load a file by double clicking on the slot. 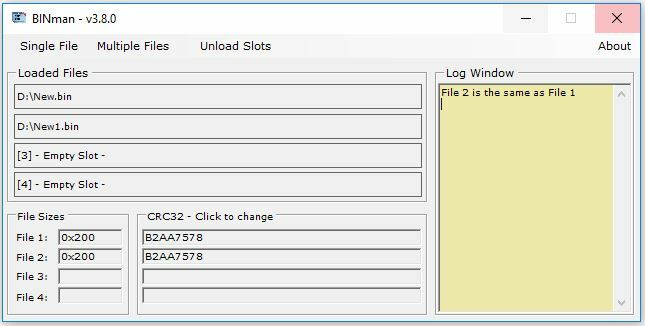 You can overwrite any loaded file by dragging and dropping a new file onto the slot. Analysing a file check for a few things. 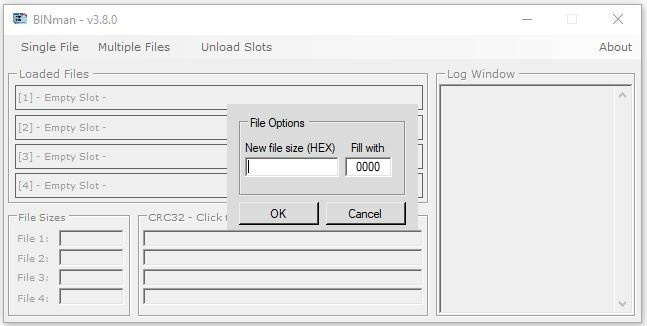 First you will need to select from the menu whether the binary file you loaded is from an 8 bit or 16 bit source. 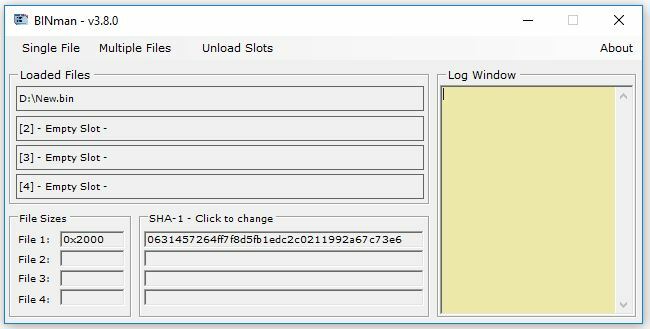 The output from the analysis will be displayed in the Log window. As you can see it has flagged up all the bits (8 bit) as being stuck LOW. This means that throughout the file non of the bits changed from logic state 0. It also shows that the upper and lower half of the file are filled with 0x0. If the file (or half the file) was filled with 0xFF then this would be flagged instead. 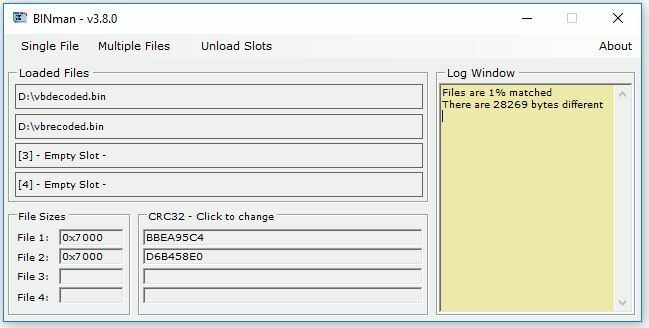 Finally, we have flagged up that the upper half of the file is identical to the lower half of the file. 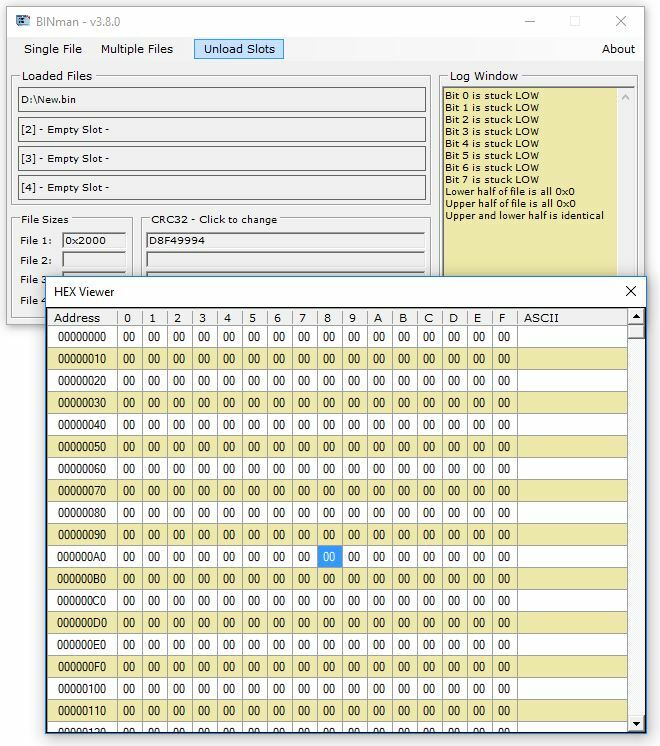 There is a basic HEX viewer built in to the program. Just double click on any of the loaded slots to view it. 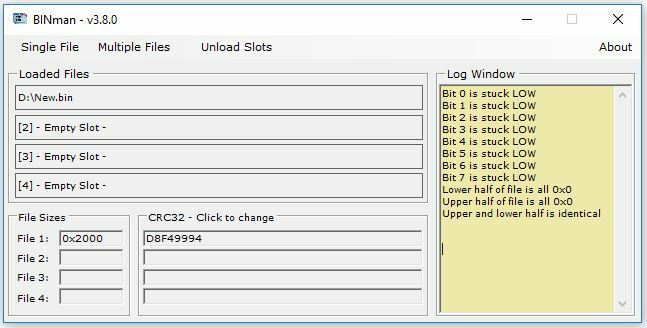 There are 3 different checksums that the program can show you. The default is CRC32 but by clicking on the “CRC32” box you can cycle between CRC32, SHA-1 and MD5. If however the files are not a match, its sometimes nice to see how much of the file actually does match. For example, if you have a a new revision ROM dump of a game you might want to see how much has actually changed. 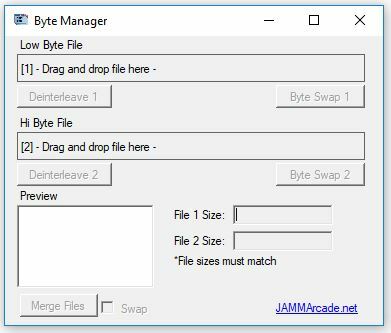 If its just 1 byte different then it could be bit rot or a region code change. 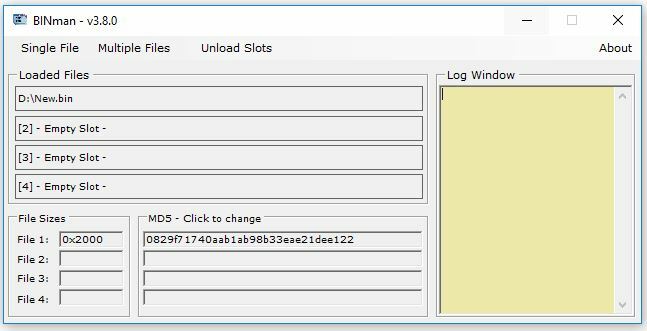 I think the rest of the functionality is self explanatory so wont go into it. The program is in the software section now. 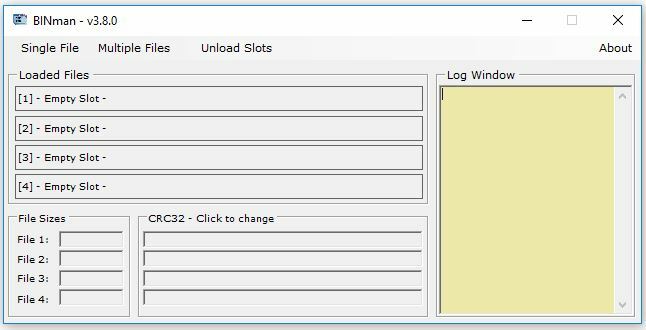 Please do let me know if you find this program useful, find any bugs or maybe want to see something added or changed (no guarantees though). I am always doing things in the background but cant unnecessarily post about it or its just not relevant.